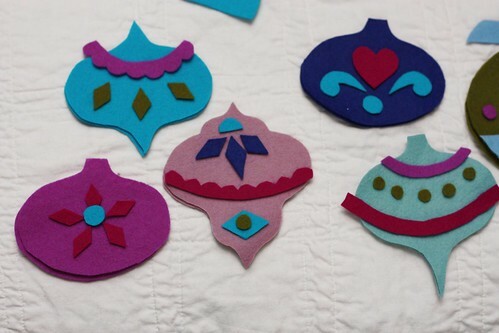 Once I got the idea to make felt ornaments, I ran with it. Man, I wish I could make these things faster. Sooo much fun! I only planned to make a few, but I'm already at a dozen (okay, a dozen & a half). These are super simple. All you need are my templates (I made them quick & dirty, my apologies! 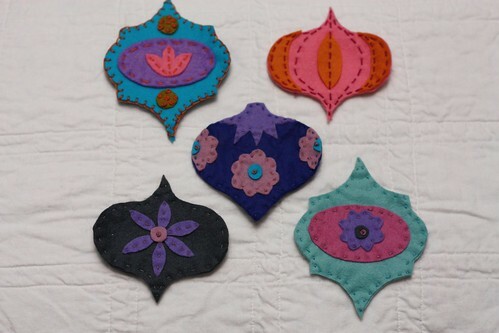 ), felt, scissors, and needle & thread. 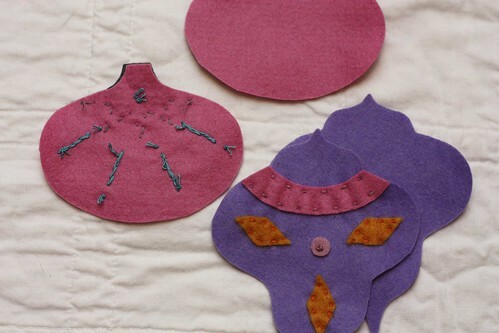 I sewed mine together and used wool felt, but you could easily use craft felt and glue, if you'd like to save time or want to do this project with kids. 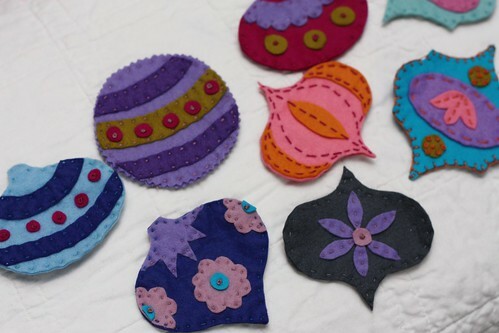 I love using french knots on all the circles. Hmm, now I'm thinking I need a polka dot one. Ava has already requested a rainbow one. I like to keep things simple - flowers, circles, diamonds, you know, easy stuff. Because I stitched mine, I cut out two ornaments of the same color, stitched my decorations to the front piece, then sewed on a back to hide all the messy stitches from my decorations. This also gave my ornaments more weight. It's been a pleasure to settle down with my ornaments in the evening after the kids go to bed. 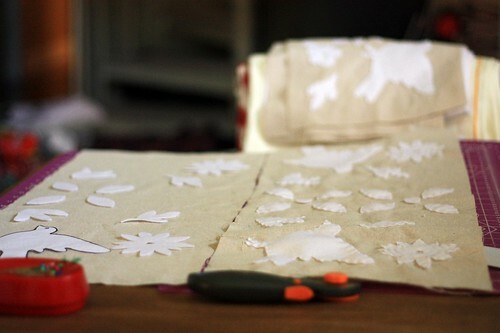 My favorite kind of evening is one with some stitching, a glass of wine and some good TV. We finally caught up on Boardwalk Empire. I'm so sad that it's over this season. Go ahead, try them. Make a dozen or two :) If you do make some, I'd love to see them. Enjoy! While cleaning up my studio recently (packing it up, but that’s another story) I came across a pack of onesies that I bought who knows when. They were size 6-9 months, which happens to be Ceci’s size right now. Hello, appliqué opportunity! 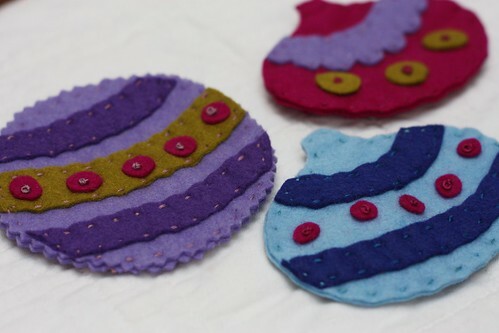 Being all about hand stitching knits right now, the first thing that popped into my mind was stitching some fun appliqué onto the front of these using my knit scraps. 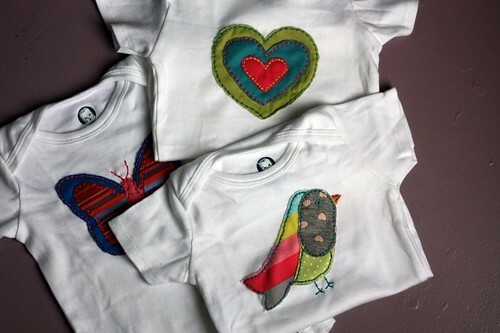 I know appliquéd onesies are nothing new, but I am so in love with these. Using knit on knit makes all the difference. What makes these even more special is that some of the knit fabrics are from outgrown clothes. 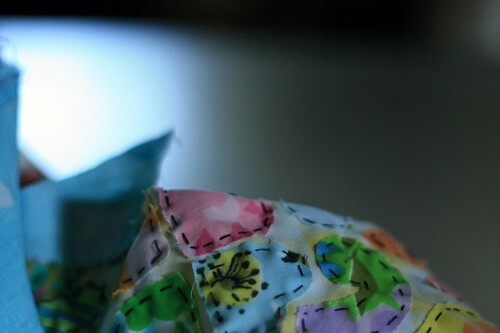 The little birdie was made using bits from 2 pairs of leggings and hat. I’ve been putting Ceci’s outgrown clothes aside with the intention of turning them into something. 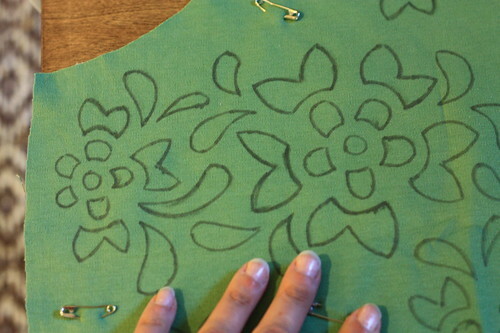 Once the onesies are outgrown, I plan to use the appliqué for something else, giving it a whole new life once again. 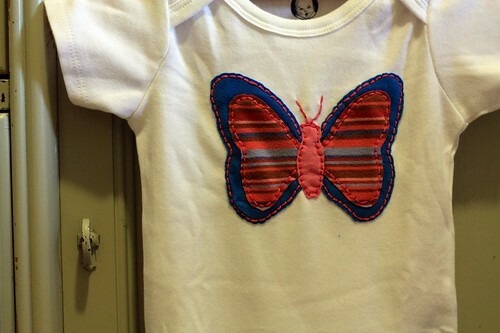 I didn’t do anything special to prepare the appliqué other than pin it onto the onesie. 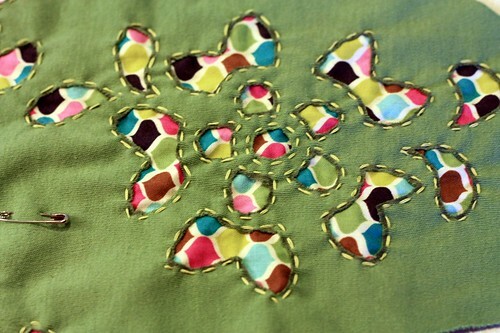 I used Lizbeth cotton thread and a backstitch to attach. 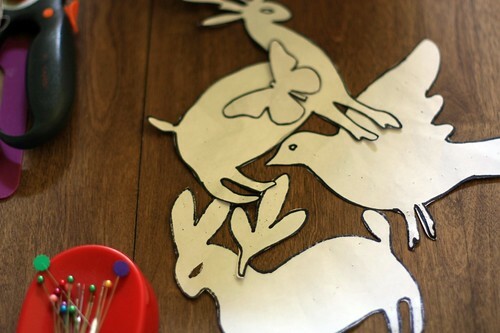 Making these was such a sweet, satisfying project. You can be sure that more of these will be made in the future. As you can see, I think Ceci approves! 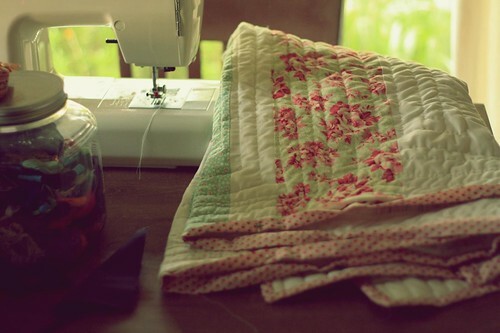 I've suddenly gotten the urge to tie up loose ends, well, of the quilt variety. I think it has to do with my desire to start a new one, but the guilt over uncompleted *gift* quilts has been holding me back. It's been kind of fun finishing these projects up because the majority of the work is already behind me. All I have left to do on them are a few hours worth of work. That makes me wonder why I never finished them in the first place. On quilt #1 I'm at the hand stitched binding phase - my favorite. 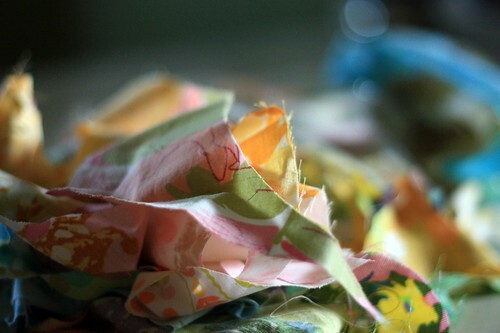 There's nothing like curling up on the sofa with a quilt on my lap to stitch some binding! 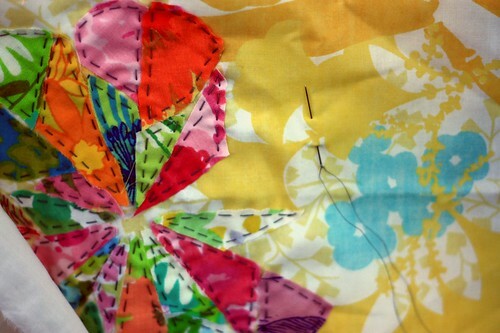 My love for hand sewing quilt binding has been pushing me through to finish quilt #2. 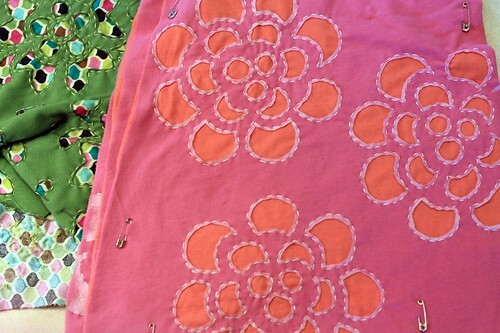 The quilt top is done, but the back needs to be pieced, then there's the quilting. 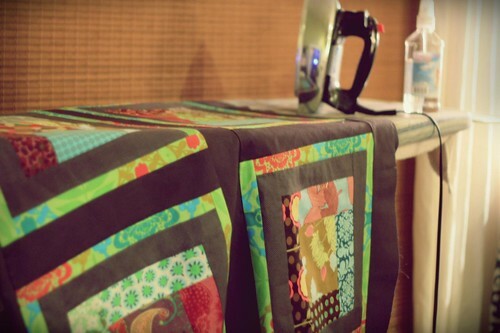 I keep my quilting pretty simple, so I should get that done in no time. In other news, I've reached beached whale status. I have to roll myself out of bed and my tops are getting too short. And I still have 3 months to go!! Yes, I'm starting to get strange looks when people ask when I'm due. Yikes!! You know me, I always have multiple projects going on at once. Before we left for our trip, I thought I should gather a few to bring with me to occupy my time on that 11-12 hour drive down to Orlando. A few weeks ago I rediscovered embroidery. When I started the project I thought that I would hang it in an embroidery hoop, but now I think it needs a patchwork border, then maybe I'll frame it. Cute, no? I started with gusto, but it sort of fell by the wayside. That's also a usual pattern of mine..
To change things up a bit I brought along some knitting. Yes, another baby sweater. 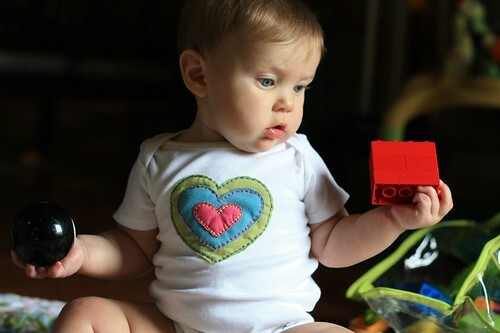 Gosh, baby sweaters are so sweet!!! I really like this pattern (details when I find them - I could have sworn I had it all in Ravelry, but apparently not!). Oh, one last thing - I'm super excited to be posting over at Habit this month. 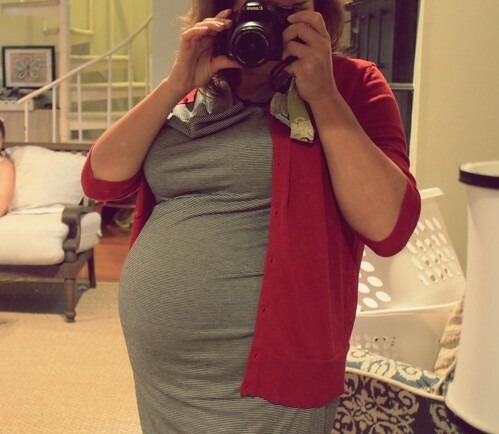 After being in a photography funk for a while (sorry abandoned 365 - I totally blame the pregnancy), I'm up for the challenge. 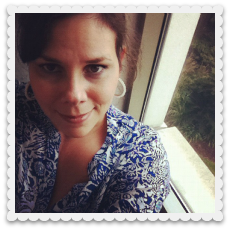 Hop on over and check it out, if you'd like. P.S. I didn't touch any one of these projects during the 22+ hours we spent on the road. Sometimes doing absolutely nothing is a just what I need. 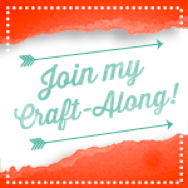 When asked by Lark Books if I would like to participate in the Sewn by Hand blog tour, I JUMPED at the chance. 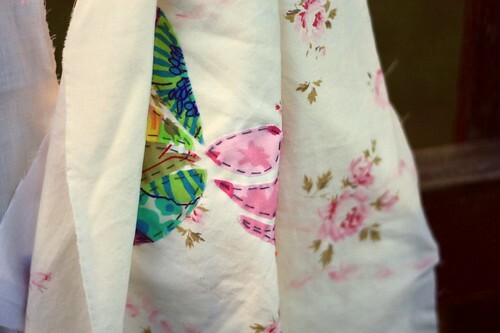 You all know that hand sewing is a new found love of mine. Believe me friends, this book does not disappoint! 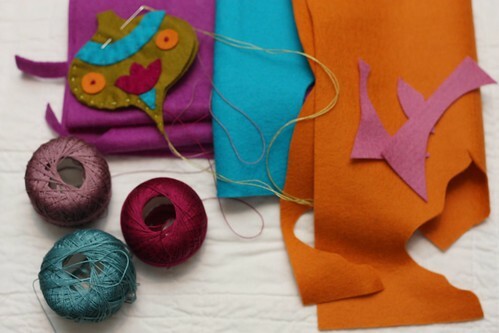 Right off the bat, author Susan Wasinger talks about "soulful stitching" - hand sewing and why she loves it – I couldn’t agree more. She brings up aspects that I’ve mentioned here many times, such as the portability of it and how relaxing it can be. One point she brought up that I hadn’t thought of was the silence of it. Yes, silence. I don’t know about you, but with my chaotic household, silence is something I cherish. It is so nice to be able to be sitting with the family quietly working on a project. 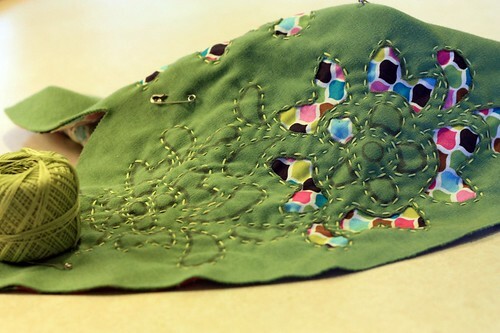 Have you ever tried to hold a conversation while sewing on your sewing machine? 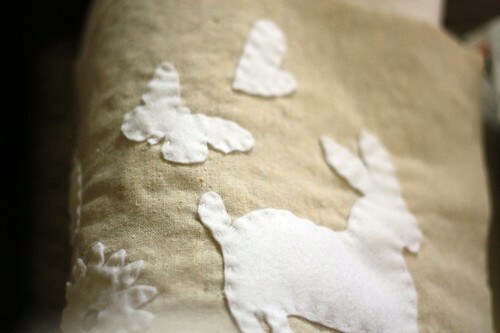 If you haven’t tried hand sewing for the pure enjoyment of it, I highly recommend it. 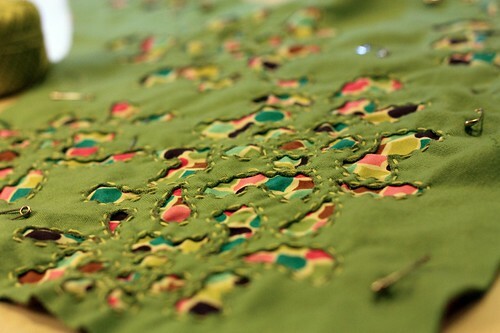 I think part of my own resistance to hand sewing was the fact that I don’t care much for hand sewing when it is utilitarian in nature – mainly mending, which was my only exposure to it. Now that I’ve been hand sewing projects from start to finish, I have a different attitude. You truly can make quality, well made projects all from hand. Along with a primer on hand sewing and a description of stitches, this book contains a wide variety of projects for all levels. 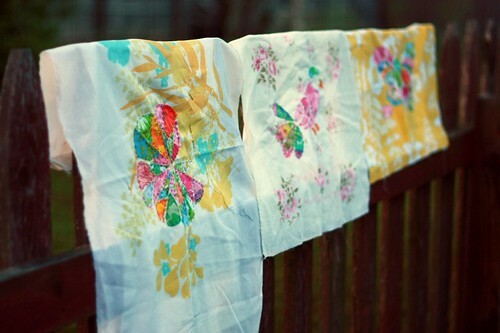 Even if you’ve never picked up a needle and thread before, you can make these projects. 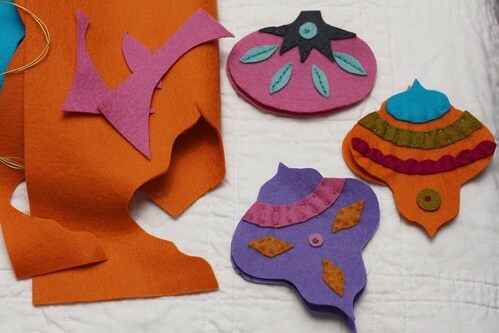 I chose to make a few projects from the book to show you. First up, I made the Big Soft Sphere. The exposed seams intrigued me. I chose to use some sheet scraps that I had lying around. It was quite simple to put together. It rated high on the portability scale (I love that the author includes a portability rating for each project – brilliant!). Most of this was made while sitting out at ball practice (yes, we’re in baseball season around here). Once I had the ball stuffed, my kids thought it was for them. They immediately wanted to throw it around the room, then Lily asked if she could make one for herself. Yes, even my 9 yr old could make this! 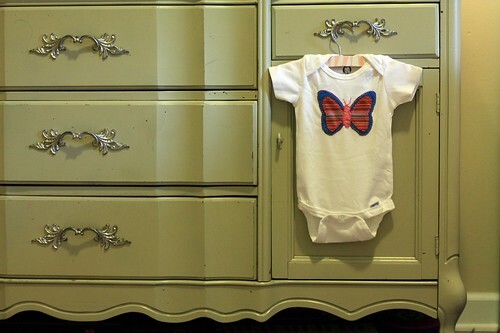 The next project I chose to make were the Personalized Bibs, though I chose not to personalize them. I think this went together even easier than the ball. 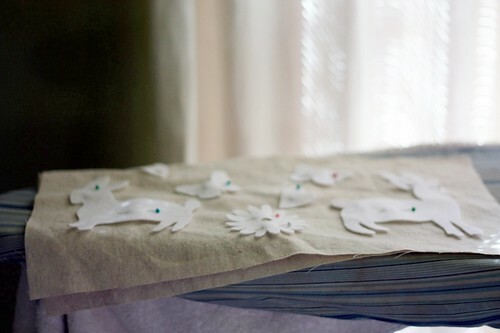 Again, it was the exposed raw edge that got me (not all the projects have raw edges, promise!). 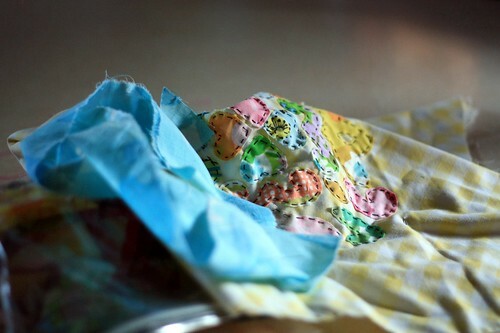 An interesting aspect to this project was that you are to use 4 layers of fabric for the bib. I wasn’t sure how I would like this, but I love it. All the layers make for a very sturdy bib. I don’t think there will be much seepage with this one. I did find that the ribbon length recommendation was a little short, but that’s probably for safety reasons. I chose to lengthen the ribbon on my second one. I think the button accent is a nice choice. Lastly, I made the Owie Puffs. Oh boy, these will be in high rotation at my house! As soon as I finished them they immediately went in the freezer to be on standby for the next time we have some sort of accident, which seems to be daily around my house. Aren’t they cute? 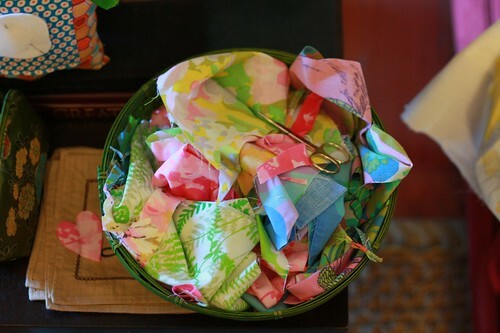 It was fun going through my scrap basket to find some fun fabrics to make these out of. I obviously chose to make some of the easier projects in the books, but that was mostly due to the time factor. Had I more time, I would have loved to tackle the apron made from a man’s shirt (the author does a wonderful job of incorporating repurposed materials for many of the projects), the linen bag (of course), and the slippers, which look pretty interesting. Lark currently has a free project from the book up on their site, if you’d like to take a look. So, would you like one of these books? 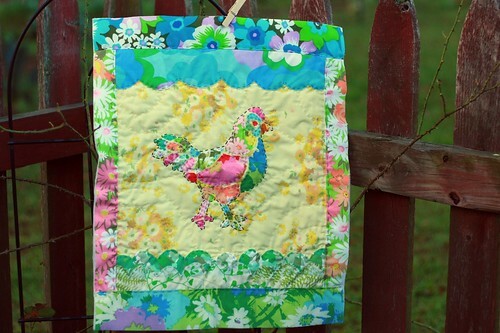 Lark is giving one away along with a small hand sewing kit, including some vintage goodies! Just leave a comment on this post now through Sunday April 17, then I’ll draw one name as the lucky winner. Good luck! Be sure to check out the schedule for more chances to win! Update: Winner is comment #38 Angie - congrats!